A rectangular pink silk pouch and address embroidered with gold sequins and silver-gilt thread. 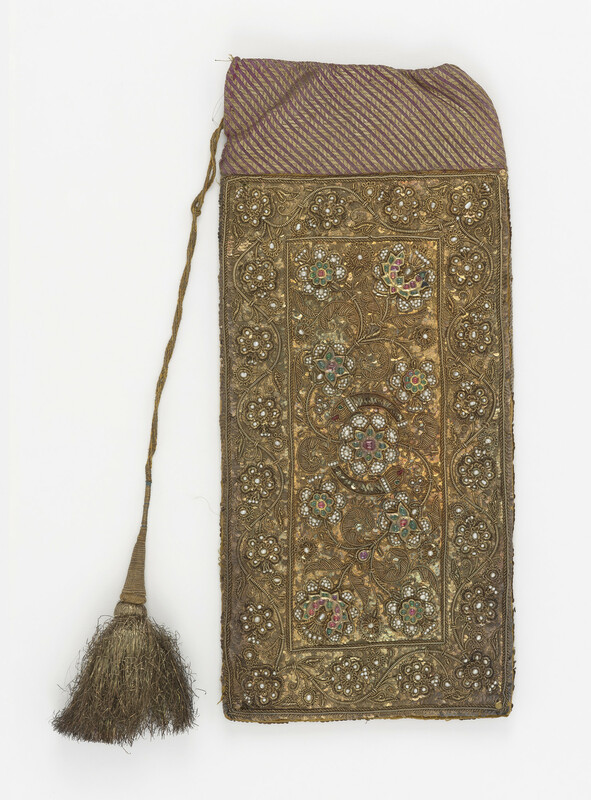 The surface of the pouch is covered with zardozi work, a type of couched embroidery using gold- and silver-gilt-wrapped thread. The pouch further embellished with pearls and flowers made of a gold frame inlaid with rubies and emeralds. The design consists of scrolling flowers, the Royal Coat of Arms and the emblem of Benares represented by two fish. The top section is of striped silk with a gold cord drawstring. An address contained within is printed on silk in Sanskrit and English and zardozi embroidery in designs of scrolling flowers and leaves. The pouch is based on the form of a kharita, a traditional envelope used by Indian nobility to send letters.